I can honestly say I never heard of seaweed until I moved to London. In Spain, we don’t really eat it and even less is part of our diet. Over the years I have discovered this fantastic ingredient first eating sushi and then in organic shops and it has become part of my diet and my kids one. 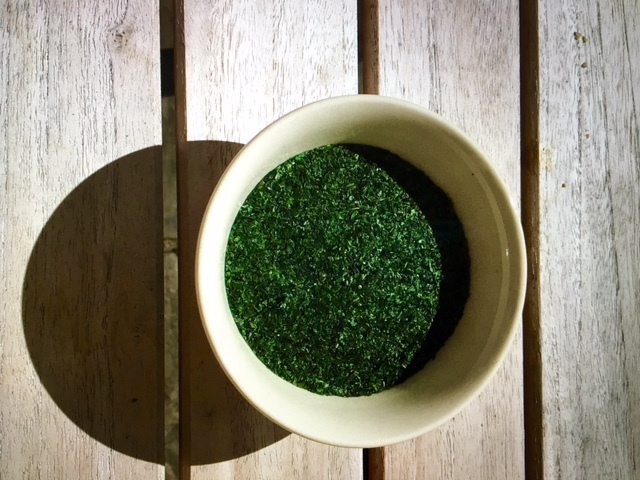 Whether you grew up eating laverbread, always choose seaweed salads or just eat sushi on occasion we are all familiar with seaweed but now that our children want sea vegetable crisps (toasted nori) as a staple school snack we need to know that this really is a beneficial food. There are several types of seaweed with Dulse, kelp, kombu, nori and wakame among the most popular. All have a similar makeup and all are nutrient dense. The mineral concentration can be up to 20 times that of plants grown on the land because they are continually bathed in the sea. Seaweed is rich in iodine, which is essential for the smooth functioning of our metabolism and thyroid gland. This is the gland that helps us regulate our hormones and if it is under active we can find ourselves prone to fatigue and weight gain. It also contains magnesium, calcium, potassium and iron. On top of that it contains vitamin C and K which help us to absorb the minerals. There is even some protein and fibre. Most seaweeds contain align a fibre which helps the transit of toxins out of the body and it’s the soluble kind so beneficial for our digestive tract. So do toasted nori snacks make it into the kids lunchbox? Absolutely they do. Toasted nori is not the most beneficial way to eat seaweed but it is definitely beneficial and it tastes so good. It is rich in umami which translates from Japanese as pleasant savoury taste. When you buy the pre packaged snacks check the ingredients. There need only be three; seaweed, good quality oil and minimal salt. Absolutely no sugar or artificial ingredients. Try to buy organic. Organic certified seaweed can’t contain heavy metals and other contaminants. You can toast the nori sheets yourself in the oven allowing you to monitor the oil and salt content. Make it more interesting and try mixing 1 tbsp of wasabi powder with 1 tbsp of water and a pinch of salt. Brush on the nori strips and bake at 250F for 12 – 15 minutes. When choosing nori the darker and less transparent the better the quality will be. Many of us should try to find ways to increase the sea vegetables in our diet. Fresh and dried is better than toasted. Use dried nori sheets to wrap sandwiches or add shreds to salads. Better still make your own salads soaking dried wakame or dulse. A simple dressing is all that is needed, rice vinegar, soy sauce, sesame oil, fresh ginger and garlic. The easiest way – put a bowl of nori sprinkles on the table and encourage the family to use as an alternative to salt.